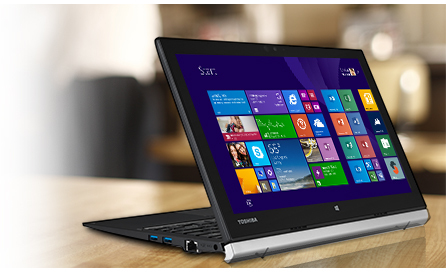 Toshiba Z20T-B-108 12.5" Touchscreen 4G LTE Laptop Core M-5Y51 4GB RAM 128GB SSD. If you have to give presentations on a regular basis, youll love the Portégé Z20t-Bs ultimate business flexibility. 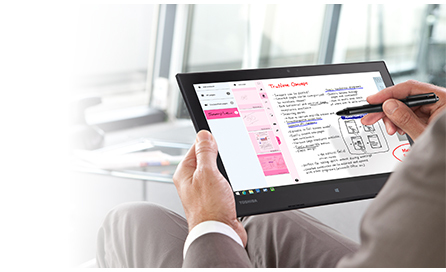 With just one click, you can transform the Ultrabook into a high performance tablet to present your work to colleagues and clients. The device's integrated handwriting recognition means you can take notes easily because the words you write with the included pen are automatically converted to digital text. What's more, there's a HDMI port for quickly linking to large screens, and the Portégé Z20t-B's thin and lightweight form factor makes it easy to carry around between meetings. 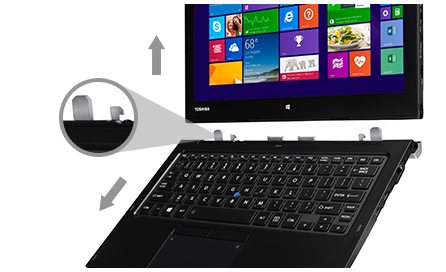 When youre at your desk, in a meeting, giving a presentation, or simply on the go, the Portégé Z20t-Bs extensive connectivity options enable you to hook up to all the peripherals you might need. 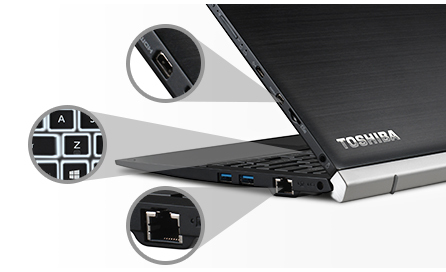 You can connect to a second screen via the HDMI or RGB ports, and access the network through the Gigabit LAN port. Impressive laptop performance is always on hand to help you tackle your multiple daily tasks and theres even a backlit keyboard for clearer typing in low light environments. However and wherever you work, its important to know that your businesss critical data is kept secure at all times. Thats why the Portégé Z20t-B offers a number of advanced features designed to provide you with peace of mind leaving you to concentrate on getting your jobs done without distraction. The devices Trusted Platform Module (TPM) safeguards the data on local storage, while Intel® Active Management Technology (AMT) allows your IT department to monitor, maintain, repair, update and upgrade machines remotely. First impressions count when youre meeting customers and clients. Thats why the Portégé Z20t-B has been designed to look the part in any professional setting. Its innovative detachable functionality means you can show-off several modes of usage and its stylish magnesium alloy chassis always looks great. The Portégé Z20t-B's sturdy build won't let you down either: at just 21 mm thin in laptop mode and 8.8 mm in tablet mode, the device is deceptively durable. The chassis is drop-tested up to 76 cm / 30, making it ultra reliable for all your daily in- and out-of-office work. In todays world of always-on computing, your device needs to stand up to relentless everyday usage. The Portégé Z20t-B has been specifically tested for repeated usage and is equipped with a battery life of up to 17 hours* that's two full working days of power, which means you wont have to charge up as frequently. Consequently, the Portégé Z20t-B is efficient to the core. It even has EPEAT Gold certification and the latest Energy Star qualification, so it can be classed as an environmentally preferable product. 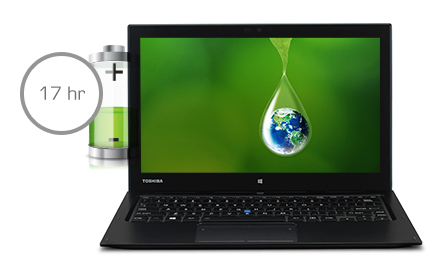 Plus, with Toshiba Eco Utility software, you can manage your PC settings to optimise your power consumption as you see fit. If work takes you out of the office, youll be prepared for almost anything with the Portégé Z20t-B. Its matt, non-reflective screen means you can work comfortably in direct sunlight and its slim design means you can carry it home easily when the sun goes down. You can even benefit from full PC performance when in tablet mode because the Ultrabook performance extends seamlessly across both of the devices modes. Whats more, with the latest wireless options including Bluetooth 4.0, Wi-Fi AC, Wi-Fi N youll still be able to connect to your colleagues wherever you go.